MC Ballyhoo and Big Top have invited Mario and friends to the Star Carnival to compete for the title of Superstar. Each player must roll a dice and move around the boards, then take part in one of over 80 new minigames to compete for Coins, used to buy Stars from Toad. 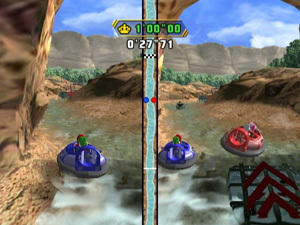 Several of the minigames use the Wii Remote motion controls to play. Once a minigame has been played in the main game it is saved to the Minigame Tent, where you can play it as many time as you like. The player who collects the most Stars from Toad at the end of the set number of turns wins the title of Superstar. The Bitsize Candy item transforms your character into an 8-bit sprite. During the ending of the Party mode, you can see moving light banners showing 8-bit Mario sprites.